Smokey is a beloved companion to his owner, Norma, and her young children. 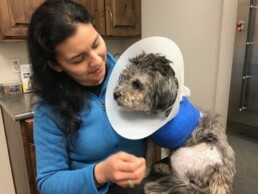 When Smokey was attacked and wounded by another dog, Norma took him to her veterinarian to have him treated. Unfortunately, his wounds were so severe that the veterinarian recommended surgical amputation of his left front leg. Smokey’s family was devastated. Their young, happy dog was suffering and they were struggling to pay for his treatment. Smokey’s veterinarian applied to TVMF for a Rusk Veterinary Assistance Grant to pay for the costly surgery. TVMF granted his request, and Smokey was able to undergo surgery without delay. Smokey’s surgery went well, and his veterinarian is continuing to monitor his recovery.